When I was young we went Guising at Halloween. Basically we dressed up, scary or not scary, went round the town knocking on doors and performing some party piece in return for some sweets, a tangerine or two or a handful of monkey nuts. Then we returned home and my mum had arranged a halloween party in the house. Usually it was just me and my neighbour. Even with just two of us, it was great fun and those halloween memories have stayed with me. We didn’t have a lot of money, though we never lacked for anything but with everything being so commercialised today I thought it was worth compiling some ideas for Halloween. Ideas that won’t cost the earth but will be fun for all and leave memories that will last a lifetime. I think for a first rate Halloween party all you need is food, some decorations and games. And to be honest you don’t really have to have the decorations but I’ve added a few ideas anyway. My mum hates cooking! We didn’t have fancy halloween snacks we had regular food but it was all labelled. Nothing looked gruesome or oozed with fake blood. It was all food we knew but every plate was labelled. Crisps became ‘witches toenails’, sausages became goblin toes and jelly became slime. It doesn’t have to take hours of culinary prowess to conjure up a Halloween spread. If you do want to go a bit out of the ordinary then here are some simple ideas. At a time when the children bring home sweets and chocolate in abundance there are loads of ways to dress up fruit in to Halloween themed treats. Take some oranges or satsumas and one black permanent marker. A little creativity and you’ve got lots of tasty mini pumpkins to eat. Use cocktail sticks to cover a pumpkin in fruit skewers/kebabs. If you can’t be bothered carving the pumpkin, draw a face on with a black marker pen. Result, one pumpkin with a wild and scary but very healthy hairdo. Buy some sausages and some ready to roll puff pastry. Roll out your pastry and cut in to strips and wrap round your sausages. Hey presto some sausage mummies. Add some eyes with writing icing. You’ll find all these Halloween ideas on my Halloween Party Food board. re doing some recently I discovered I could paint rock monsters really quickly and keep his interest. I’ve since seen a suggestion for using these for Halloween. What’s more you could paint your rocks, use them for your party and then hide your rocks later for others to find. You could even have monster rock painting as an activity at your Halloween party. All you need are some rocks, some paint (acrylic is good) and some permanent markers. You don’t have to give your rocks a background colour. With just a couple of marker pens you can do eyes and teeth on any rock and they look really fun, cute and so quick to do. I found that a white marker pen was a lot quicker and less messy than paint! Use old sheets or towels draped over a balloon and hang up to make ‘ghosts’. Add eyes if you like or just leave ghostly shapes hanging (especially if you want to reuse your sheets!). Everyone likes colouring in. You could colour in this giant poster/tablecloth over the days leading up to Halloween or have it out as an activity at the party. Either way it will provide some much needed therapy on a scary night. You’ll need your black marker pen again for this game and some toilet rolls. Draw black eyes and ghostly mouths on your whole toilet rolls. Stack them up and then play knocking them down. Use a pumpkin as a bowling ball. I’ve seen this game done with plastic cups too but you can always reuse the toilet rolls after. While you’re buying toilet roll in bulk anyway, you can play wrap the mummy. Choose one or two ‘volunteers’ to be the mummies. See how long it takes to wrap them in toilet roll, please do leave a space for the mouth and nose! Or split in to teams and race to wrap, or give a time limit and see who wraps the most in, say, 5 minutes. If you can get pumpkins with stalks still on then set them up for a ring toss. Use glow sticks in the dark for extra spook fun. Of course there is also dooking (or dunking) for apples, also called apple bobbing. Not sure it passes health and safety requirements these days but it’s a classic. Do have a towel on hand! We used to make treacle scones and hang them up on a string. We had to try and get one in our mouths with our hands behind our backs. I have to say that jam doughnuts are my children’s preferred food to stretch for. 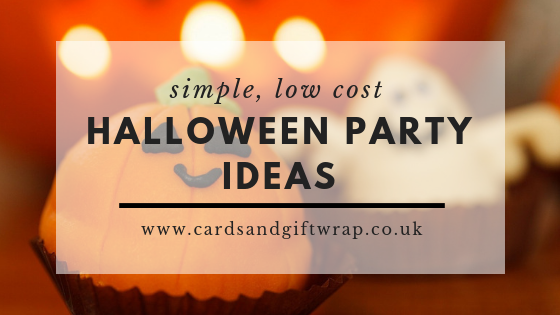 I hope I’ve given you some ideas for how to run a Halloween Party without great expense and without too much time to prepare. Your children will love it. I’d love to hear what other simple, low cost Halloween ideas you have or how your party went. Do leave your ideas in the comments below.